Happy Friday everyone! It is time for new challenge at Card Makin' Mamas - Kids. 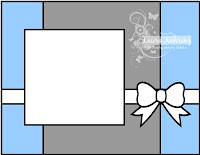 And a fabulous sponsor of this month is Bugaboo Stamps. Come join us in this fun challenge! Я знову до вас із листівочкою, і цього разу як дизайнер блогу Card Makin' Mamas, де починається нове завдання - Дитяче, тобто будь-яка листівка на дитячу тематику чи дітками на ній підійде до участі в завданні. 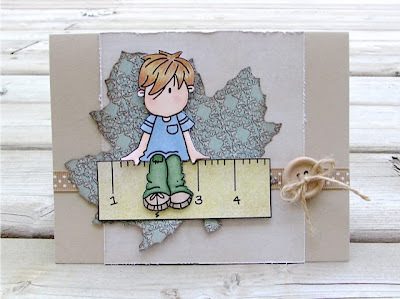 For this Challenge I made a card using one of the stamps I purchased earlier but never got a chance to use it until now - Ruler Boy. 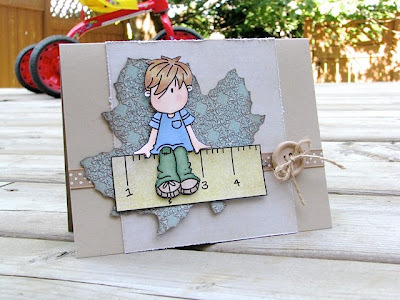 I used craft paper by Stampin' Up! and GCD Studios Fub&Funky paper set for middle and leaf, which I die cut using Spellbinders die. A ribbon, button and twine added nice little accents to my card. Для цього завдання я обрала зображення від спонсора, яке купила ще давніше, але не встигла використати в роботі тоді, коли планувала, тому була рада, що нарешті випала нагода. Основа для листівки - крафт папір від Stampin' Up! На листівці використаний папір з набору Fun&Funky від GCD Studios Листочок я вирізала за допомогою ножів від Спелбайндерс та ледь затонувала по краях. Додала стрічечку та ґудзика зі шнурочком і вийшла отака досить проста листівка. I printed this image twice to cut the ruler out from dp and coloured a boy image with copic markers. I fussy cut it and adhered to my card using dimensionals from Stampin' Up! Штампик я роздрукувала двічі - на папері для розмальовування фломастерами копік та на кольоровому папері, звідки вирізала тільки лінієчку, на якій сидить смішний школярик. Хлопчика я розмалювала й також вирізала і прикріпила на об'ємні квадратики від Satmpin' Up! (це мої улюблені об'ємні квадратики, оскільки вони вдвічі тонші від стандартних і дуже зручні в користуванні). У роботі використала ось такий скетч від Tuesday Morning Sketches. This is so pretty!! Very cute image and I love the leaf!! Cute card! The image is adorable, and you've done a lovely card. Thank you for sharing with us this week at Tuesday Morning Sketches. sooo cute card. Love your design. Super cute! Thanks so much for playing along with The Pink Elephant this week! Another cute card for a little boy! Love it! Thanks for sharing it with us at Cards in Envy! very cute card. thanks for joining us at Crafty Sentiments this week! 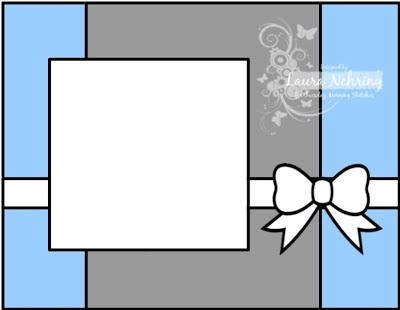 I just love creating cards using sketches, your card is super cute, just like your other one your entered, this image is super cute! 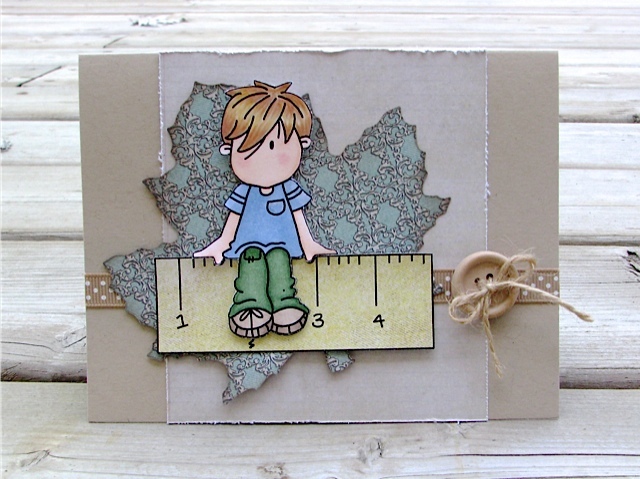 Thanks for joining our C&S challenge over at The Paper Nest Dolls Challenge Blog! 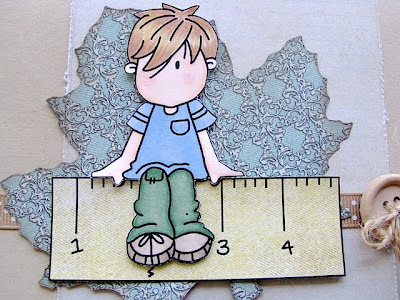 Soooooo cool, I love the ruler idea! 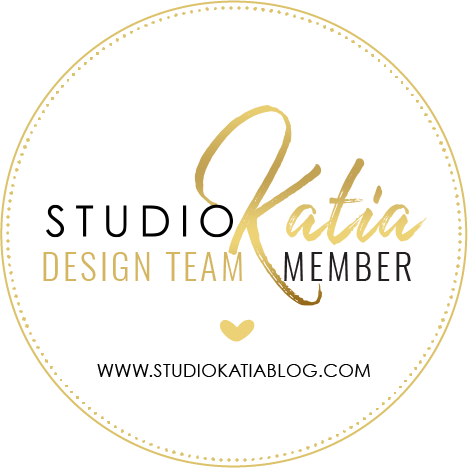 Thank you for joining our Clean and Simple Challenge at The Paper Nest Dolls. a beautiful take on the sketch! Love this CAS design and that you fussy-cut the image. It really makes him pop! Love this card--and this sketch. Thanks for playing in Bugaboo's "Anything Goes" challenge. Super cute and perfect for a boy. Love the design. Thank you for joining us at cards in envy. Cute image and card. Thanks for playing with us at Cards in Envy. oh my gosh adorable!!!! LOVE the image!! sooo glad you played along with Cards in Envy!! !